Ed played as many gigs as he could while he was in London. He played gigs in small venues, and sold CDs out of his backpack to make some extra money. He sometimes performed to groups as small as five people. There were even times when only his parents were there. In 2008, he played more than 300 gigs. By the time he got a real paying gig, he had played over 400 gigs for free. Every experience added to his next show. He learned how to be more polished, and how to perform and interact with fans. Ed Sheeran and Kate Middleton, both part of the “Superstars!” series, are each 32 pages long, with five of those pages being given over to: a contents page, a timeline of important events in the subject's life, a glossary of terms, a “Find Out More” page that has a selected bibliography and some websites, and an index page with the author's information included. Otherwise, each double spread consists of one photograph on each page (or a large photo covering the bottom of the spread), optional captions to the photographs or a spiky word balloon that has a titbit of related information, a citation from an article or interview tagged “He Said It!” or “She Said It!”, and one or two titled paragraphs illustrating a point in the subject's life or an aspect of the person’s character. In Ed Sheeran's case, these paragraphs include information about his childhood, musical influences and early career, albums and collaborating artists, awards, and charitable activities. Kate Middleton's information includes her childhood, student activities, romance with Prince William, treatment by the media, marriage, children, and charitable activities. The photographs in both titles are stock images, and they can vary slightly in their quality but are generally well chosen. In the volume focused on Ed Sheeran, parts could have been explained in more detail. For example, in the excerpt above, there is no knowing exactly how Sheeran improved his show; readers can only take the author's word for it that Sheeran learned to interact with his fans. I have many such small gripes with the text where I think, “Yes, but what exactly happened/did he do?” There is some ambiguity in that same excerpt, for example, as to how many gigs, paying and non-paying, he played in total. However, overall, Ed Sheeran is a well-balanced overview of a famous person that maintains a positive tone without becoming worshipful. 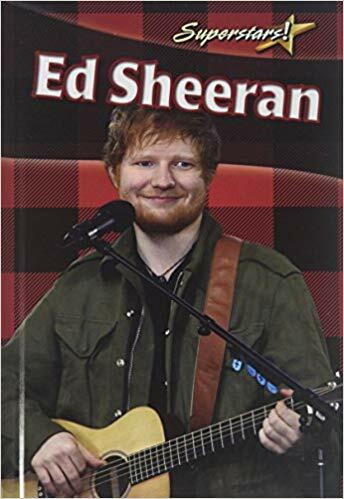 The book would interest a grades 3-6 group, but older readers will want more details about Sheeran than this book can provide. The themes in Kate Middleton could have been organized more effectively. Kate is stated to be a 'working royal' , but the text does not provide a definition of the term. Later in the book, there is a brief description of some taxpayers feeling angry about their taxes being used as travel funds by the royal family (p.26). The opposing opinion is that the royal family earns its keep through charitable work and promotion of British products. Then the text moves on suddenly to an actual trip the royal pair made in 2014 which is jarring considering it could have been an excellent segue into an exploration of the role that Britain's royal family plays. On page 21, there is a mention of Middleton’s writing her own speech for a charitable organization she supports, but it appears without much context on the same page as the excerpt above which focuses mainly on fashion. Page 24 explicitly states that Middleton carefully chooses her charities and supports them by providing media exposure. These three disparate chunks could have been tied together beautifully, and it is a bit disappointing to see them tossed around without any cohesion. However, like Ed Sheeran, overall Kate Middleton is a creditable attempt to provide a balanced look at a complex role being filled by a likeable person. Saeyong Kim has an MA in Children’s Literature and an MLIS; she lives in British Columbia where she works as a public librarian.